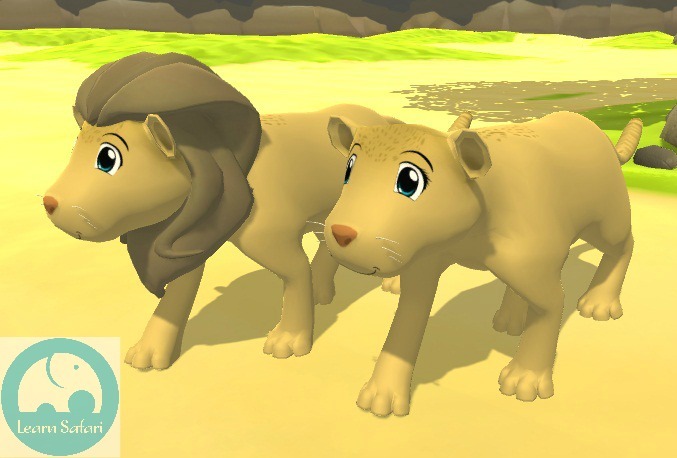 The lion is known as the King of the Jungle…err, savanna. Frankly, I’ve never understood why they lions are called the king of the jungle, since they do not live under a tree canopy, but in the open grasslands of the savanna. The better term for them is the King of Beasts. Whatever we call them, lions are ferocious animals, and you just don’t mess with them. Even our Learn Safari friends are a bit scared when they first meet Oscar el León, until they get to know him that is. (well, in reality, some of them are always scared of Oscar!) As you might have guessed, Oscar pops in to help teach the letter O. This time, coming up with a name was very easy. No relation to the famous sonero,* although he does enjoy his tocayo's** music. It’s actually a family name. My grandfather, uncle, and a cousin’s son are all named Oscar. They are strong, intelligent men who inspire confidence, respect, and even a healthy dose of fear (just stay on their good side). Like our other characters, Oscar went through a series of transformations. Oscar started off looking super cute and cuddly. Nothing like the brave and ferocious lion users will encounter in their quest. Check him out below. Once our 3D modeler, Vince, got a hold of Oscar, he made a few changes. He made his face less round, which gave him a much more grown-up look. He also changed his body to more closely resemble a real lion. He's much more sleek and looks like he can chase down a herd of gazelles! Even though Oscar is a bit more fierce, he is still a very caring friend. He goes to great lengths to protect the savanna and he is very close to his family. In fact, he is often seen hanging out with his twin sister Melissa, who is an adorable female version of himself. In spite of the fact that she is super cute, don't be fooled. She is one tough cookie! What do you guys think of Oscar? Let us know in the comments! *If you did not know, the sonero I mentioned above is Oscar D'León, a famous Venezuelan salsa singer. **A tocayo is someone who shares the same name as another.